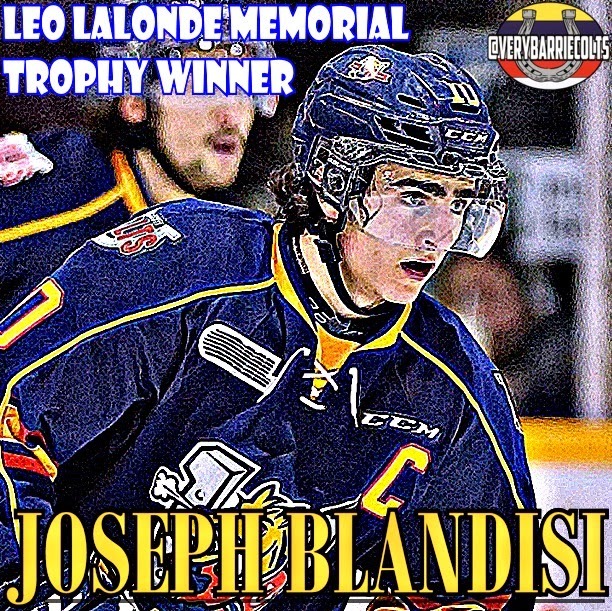 Joseph Blandisi Wins Leo Lalonde Memorial Trophy (OA Player of the Year) #OHL - Very Barrie Colts | A website covering the Barrie Colts of the OHL. Yesterday, Barrie Colt captain Joseph Blandisi was named the winner of the 2014-15 Leo Lalonde Memorial Trophy. This is the award handed out annually in the OHL to the overage player of the year in the Ontario Hockey League. This makes Blandisi the second Barrie Colt to be chosen for the award since Bryan Cameron won it in the 2009-10 season. This is the 32 time the award has been presented since it was first awarded to Don McLaren of the Erie Otters following the 1983-84 season. Joseph Blandisi finished the 2014-15 season 4th in the OHL with 112 points. Over 68 games he would score 52 goals (most in the OHL) and 60 assists. He also finished the season with 126 penalty minutes which is almost as many as the top 3 scorers combined (10th most in the OHL). Can't help but wonder how many point Joseph could have put up if he spent a little time in the box..
Blandisi also finished the regular season with the most short handed goals scoring 10, while assisting on 2 goals when down a man. Not only was Blandisi effective scoring on the penalty kill but he was also a monster when it came to scoring insurance goals. Joseph led the league with 9 insurance goals this season. Another impressive stat is in 68 games this season, Blandisi was only held off the score sheet in 10 games. He also had two 5 point game; five 4 point games and nine 3 point games. Though Blandisi couldn't carry his team beyond the semi-finals of the Playoffs he put forth a heck of an effort. He got 14 points in the 9 playoff games the Colts played in. Scoring 6 goals and getting 8 helpers. Blandisi had an incredible OHL career that lasted 4 seasons. In that time he played in 246 regular season games in Owen Sound, Ottawa and here in Barrie where he was the captain for his final season. Over his career he 108 goals, 136 assists for a total of 244 points. He only appeared in 14 playoff games where he would total 15 points. Blandisi was a great guy and a fun player to watch. No doubt the fans will be looking forward to see the next step in his hockey career. That step is the New Jersey Devils Organization. This season Joseph signed a 3 year/$650,000 (2-way) deal with the New Jersey Devils. No doubt that he will be a huge addition to that organization. He will not only bring his skill but also a incredible person. We would like to thank Joseph for his time here in Barrie and we want to congratulate him on being named the OHL OA Player of the year and wish him the best of luck in his career.